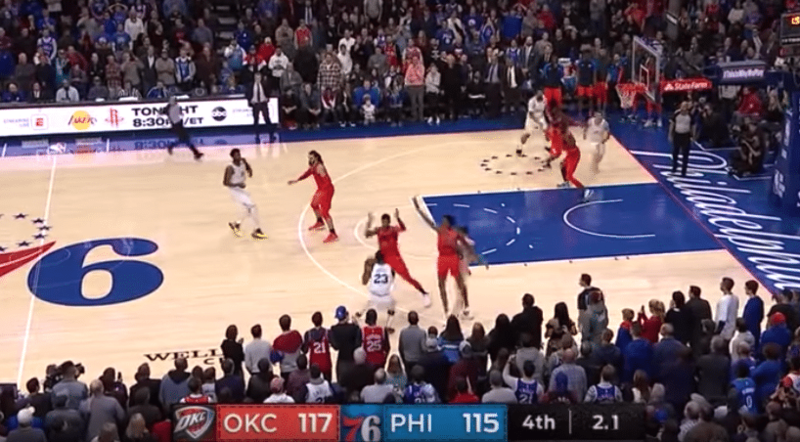 Ben Simmons is a great player but nothing illustrated how his lack of an outside shot hurts this team more than the final sequence. The thunder ignored him and immediately doubled butler. He really needs to take that shot from the gym to the court. Butler could have easily split the double and taken a mid-range shot, or Simmons could have rolled to the rim (which he didn't). The defense didn't take options away, we messed up. It really wasn't the Thunder taking advantage of Simmons this time. I would have to disagree. Once Simmons stopped his dribble they rolled off of him and doubled butler. Simmons is not even a thought from beyond 10 feet. Best money I spend each year, BTW. Subscribe if you like Philly sports! Doesn't help we don't have a coach who doesn't force him to take shots. Save Covington and Embiid (who I think would've been a dominant player regardless of coach), Brown doesn't have a great player development record as far as I'm concerned, and he seemed to be touted as a guru in this area. Brown was good in terms of developing Cov, TJ, Noel, Saric, and Grant. Not so good with Okafor, Fultz (special circumstances? ), TLC, Korkmaz, McDaniel, and most of the other d-leaguers and borderline 10-day players. I think it's a fair criticism that players have not improved as much under him as we would hope. Frazier and Ish Smith were noticeably better after moving on. If Saric improves a lot it would be pretty telling, but so far he seems to be about the same guy. Agreed, Brown needs to be pushed on this more. The media loves him and thus gives him a pass, but the problem is by the time Simmons et al. have developed their games, we will have a hard time affording to keep all of them. The other issues are turnovers continue to be a problem and the bench desperately needs help. Hopefully, Brand is working on moves to help out. Nice win for the Sixers tonight. 10-0 run to win by 2. Another triple double for Simmons. With 90 seconds left they were down 8 without the ball. Great run. They do need a couple more players off the bench. Bolden had a huge run in the second quarter, two blocks and a dunk at the offensive end. The sixers seem to need some help in the front court that would allow them to take some pressure of of Embiid...does marc gasol fit that? would also bring a certain amount of toughness. It worked out at the end but after missing the first free throw with 1.1 left I don’t know why they didn’t tell Brewer to miss the second one on purpose. If he misses and the spurs rebound and call time out, how much time comes off the clock? .3 seconds? Then a 2-point basket in 0.8 seconds beats you. I think making the shot is the right move. Anthony Davis has told the Pelicans he won’t resign no matter what, according to Woj. Simmons for Davis? Would do in a heartbeat. Would you include the Phoenix pick? I would. Certainly not with the pick, and I doubt even straight up in my opinion. Davis has made it clear he is going to be a FA and I suspect will join the Lakers, I wouldnt just give up Simmons for that. In fact, not even if he would sign a contract (which he obviously wont) as Davis and Embiid would constantly be in each others way offensively. Saying "NO" to all Simmons trades. He's historically good for his level of experience. Let him grow. Good points. Also, without Simmons, we'd be short a quality PG. Y’all are nuts. You are talking about have 2 of maybe the 6-7 best players in the NBA on the team, including the 2nd best behind LeBron, both of whom are 7 ft+ and 25 or younger. Simmons is terrific, but is maybe Top 15-20 or so and may never be able to shoot or shoot free throws, both of which are major issues. Davis doesn’t want to be a center, so that’s fine for us, and has a great face/3pt up game, can switch basically all the way down and, with both Embiid and Davis on the court, the rim is a no fly zone. With Butler the team is devastating, and a solid point guard is easier to find than a perfectly fitting superstar.